The escalating price and declining availability of oil , combined with increasing concerns about energy security and climate change, have prompted the United States to seriously assess alternative sources of transportation fuels. Corn has ushered the United States into alternative fuels, and cellulosic biomass promises to boost domestic production in the future. Meanwhile, Latin America has tremendous potential to become a global biofuels leader and thus contribute to U.S. energy security and climate stabilization. The availability of land, a favorable climate, agricultural experience and ethanol know-how are key attributes of that potential. Closer cooperation between the United States and Latin America will enhance U.S. energy security by capitalizing on the continent’s biofuels capabilities. Ethanol production from cane and cellulosic biomass is powered by renewable energy derived from bagasse or other biomass, whereas corn ethanol production relies mostly on natural gas. Cellulosic biomass holds significant promise for the world’s future fuel needs as it constitutes an agricultural residue that in many cases is already collected and inexpensive. It has no food or feed value and therefore no effect on food availability and prices. It is abundant, particularly in the form of sugarcane bagasse and wood waste throughout the Americas, enabling many countries to produce biofuels domestically. By nature it contains significant amounts of water (more than 50 percent) and has significant caloric value as a solid fuel, which could eventually render ethanol production water and energy self-sufficient. If expectations for cellulosic ethanol are not properly managed, the whole biofuels industry will suffer from a potentially fatal public and investor reaction. There have already been ‘false starts’ in the past. This time around, when policy, technology and investment have finally converged, we can not afford to miss the golden opportunity for a long-term prospective. Ethanol and other biofuels are a key part of the solution to our country’s need for energy diversification. The corn industry has introduced Americans to a new era of fuels, but we need additional abundant ethanol resources to break our addiction to oil. Domestic cellulosic biomass and biofuels from Latin America are two key sustainable resources. The U.S. needs to pursue a four-prong biofuels strategy. 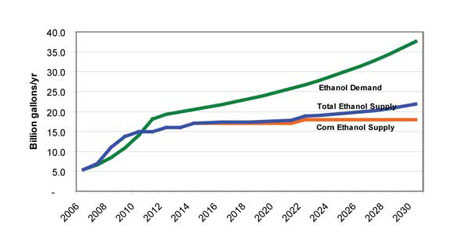 First, the corn industry needs to improve the sustainability of its ethanol by eliminating fossil energy use and concentrating on agronomic and process improvements rather than conversion of more U.S. land to ethanol production. Mercedes are aiming to end the need for filling your fuel tank with petrol or diesel within just 7 years.